The guys I’ve been playing with lately are a pretty vocal group, particularly when it comes to the hands they play. As for me, I’m generally too concerned about my table image and how anything I say might tip someone off to my playing habits. I’m no shark but over the years, I’ve definitely won more than I’ve lost. My game is pretty standard. Tight, conservative play peppered with selective aggressiveness when the timing is right to keep opponents on their toes. One thing I definitely do not do at the poker table, however, is play ‘favorite hands.’ There’s no two cards I can be dealt, other than aces, kings or queens, that I feel compelled to play simply because it’s my ‘lucky hand’ or because I’ve won with them in the past. For example, I’ve played with guys that love to play 6-9 just because of the sexual innuendo. Never mind that it’s likely a loser against any serious hands. I have another friend, an animal lover, who refuses to lay down K-9. With king-nine, you’re behind against pretty much any decent pre-flop hand, as in K-10, K-J, K-Q, K-K and A-K, not to mention Ace-anything or any pair. That’s a lot of opportunity to lose money. Yet people still play their ‘lucky hands’ because they’ve won with them in the past or because the hands supposedly mean something. Personally, my favorite hand is the one that’s going to win me that particular pot. 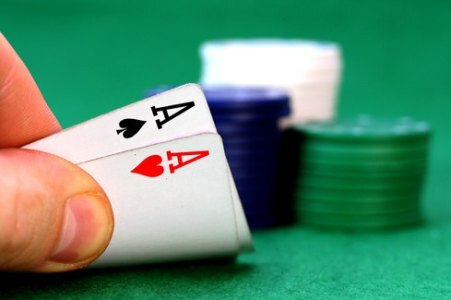 Pre-flop, there’s no guarantee that ANY hand, even pocket aces, is a winner unless you can get your opponents to fold. I don’t pledge allegiance to a hand just because it’s won me a big pot in the past. 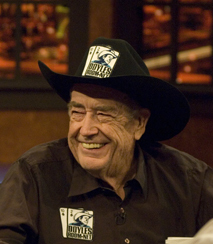 Doyle Brunson made the 10-2 famous when he won the 1976 World Series of Poker title with it. But it was a horrible play. Head-to-head, he went all in on a bluff after hitting a ten on the flop. He got called by top two pair (Aces and Jacks), then sucked out when a third ten hit on the river, adding another bracelet to his already impressive resume. Doyle’s a millionaire, one of the greatest poker players in history. He can afford to play whatever hands he likes. Other than that, 10-2 is a near surefire loser. Have you ever played it when facing a raise? Probably not. If you have, please invite me to your home game. No limit hold ‘em is a game of long-term benefits. People have a tendency to forget this, focusing on what they’ve won that night, not over time. For every time you’ve won a pot with K-9, 6-9 or whatever your favorite hand might be, you’ve probably lost with it three or four times over. Don’t get me wrong. I’ll play garbage, recognizing the value of a properly timed bluff, but I don’t prefer one random hand over another. A bluff wins with 7-2 just as often as it does with K-9 if no one calls. Winning with these non-premium hands depends on the context of the table, your perceived table image, your position, your chip stack and a slew of other factors. I’m not going to stubbornly play a hand I’ve won with before if the price isn’t right. I wouldn’t even call a minimum raise with a 10-2, 6-9, K-9 in my hand unless the situation warranted it. In the long run, the odds are against me. What I WILL do, however, is look for people who play those hands religiously, then strike. If I know some stooge consistently plays 6-9, there’s no way he’s going to get a free look at the flop if I have anything to say about it. If you’re a poker player just starting out, beware the inclination to play a hand just because it’s your favorite or because you think it holds some sort of significance. Unless of course your intention is to lose money. The same lessons apply to online poker, but with any sort of online betting, at least you don’t have to worry about people laughing in your face. This entry was posted in Card Table, Life of Sports Chump and tagged Doyle Brunson, Poker Table, World Series of Poker by Chris Humpherys. Bookmark the permalink. You can’t fault Doyle as he’s as good as they come. It Was A Good Day Well In The NFL It Was ’til the Browns And Bills Sank Into The Bowels Of Ineptitude ………. The above is my NFL roundup piece. Let me know what you think as to the merits of the piece ? I’ll look forward to reading your comments. Al… Have you ever seen High Stakes Poker on GSN? He’s a regular at the table. It’s nice to see the young players still pay proper respect to his game… and fear him as well. He’s a legend and he will still take your money if you’re not careful, or even if you are. Talk about dog hands? I’m nicknaming Damiens…”The Dog Pound”……more slop hands played there than the Humane society. I wish, Fritchie. Funds are tight right now. I also failed to mention in the post Damion’s liking for the pocket sixes in hopes of landing another six on the flop. I used to play poker with a friend who would not bet aces over eights. I know all about the dead man’s hand thing, but if I thought it would win the pot I’d say screw superstition. Actually, Aer… that’s not a bad hand NOT to play. I’m hard pressed to play Ace-rag unless I’m playing it for cheap and even then I’m cautious.